I woke up early today. Not on purpose, either. Normally I squeeze every little second out of sleepy time. I think my electronics have a mind of their own, though, and even though I tell them not to “leap ahead” or “fall back” for DST, they do. And at random times. Like last week, waking me up an hour earlier. And this week, waking me up an hour earlier. This morning it was 6am. See, I set my television to The Weather Channel every morning for my alarm. I’m not entirely sure why, or how that started. I might have set it to music television years ago, but that’s when they actually played music on those channels, instead of reality shows. It was hit or miss what song would come on, and sometimes they would be eerie or sad and it wasn’t quite the morning wake up I was looking for. Not… that weather is, but at least it sounds like morning time to me. Again, hearing words like “tornado” or “massive storms” isn’t necessarily the make for a first-morning encounter, but it is what it is. At any rate, the alarm (set for 7am) woke me at 6am. I crawled out of bed at 6:20, cursing in my head. Looked at the clock, and then began a string of more violent curses. I played the barter game, do I stay up? Do I go to sleep again and reset my alarm? Wait, I have to go to the bathroom… will I be able to go back to sleep? Then I remembered the curlers in my hair. That was after the split second of thinking I might get up and workout. Haha! It was a serious thought. But I wasn’t about to redo my hair. I found a middle ground and decided to get up, have a morning of quiet leisure (since I knew nobody would be getting up on spring break at this time). 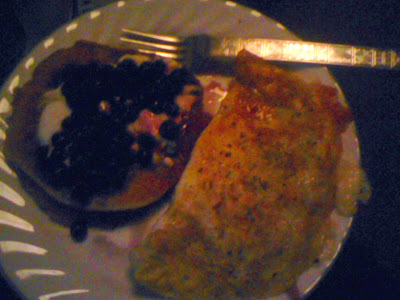 I made an omelet, coffee, and heated up some pancakes from yesterday. I realize that is a horrible picture. But all I had was my camera phone in dim lighting. Too lazy to do a awe-inspiring hookup of my food this morning. Mmm. I topped it with homemade yogurt and blueberries, the pancakes that is. The omelet is provolone, tomato and ham.Was a deliciously top-heavy morning (big breakfast). No need to lug my coffee mug or lunch to work, I think I’ll have a light snack there if I need to. Now I am off to work. Have a great day!